Which hair dryers are best? In the UK 2017 almost every household has one (or more). They range in price from around £15 to an eye-watering £80 or more. But which hairdryer is the best buy for you? At Best Buys Compared we’ve surveyed the people who really know the answer: Owners and users who’ve paid out hard cash for their blow dryer. These people have used their hairdryer in a salon or at home for 3 months or more. So far, we’ve surveyed more than sixtenn hundred people. With their help we’ve been able to draw up the UK’s best buy hair dryers survey 2017. Our survey responders told us – it’s the Parlux 3800. Find out why this dryer has what it takes to be voted number one on our which hair dryer is best page. 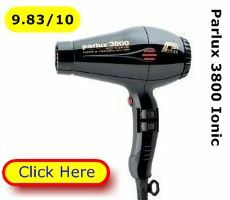 Note: The Parlux 3800 is designed for professional hair stylists and home users who want the best beauty tool for their hair. But, we’ve also found the most highly user-rated dryers for travel and home use – at bargain prices! Our top 10 is based on more than 1,685 user reviews of the most popular dryers available in the UK today. • Will it suit my hair type and length? • Can I use this in salon, at home or on my travels? • Is it light and well-balanced to minimise fatigue? • Are there beauty tool attachments for my hair type? • Is it an ionic hair dryer? 1 Will it suit my hair type and length? You’ll also find this handy table on our comparison page. 2 Where will you use your dryer? If you want a professional hair dryer for intensive salon work you’ll value robust construction, a long lasting motor, plus flexible heat controls. The Parlux 3800 or ETI 3500 have these qualities. If you are after a travel hair dryer you’ll prize light weight and compactness. The BaByliss 5344U and Wahl MaxPro 1600 have these benefits. For daily home use you may be interested in value for money and ease of use. BaByliss 5560GU and Babyliss 5589U PowerLite fit the bill. 3 Is it light and well-balanced to minimise fatigue? Some cheap dryers are just a casing and a housing wrapped round a motor/heater. These can be heavy and unbalanced - leading to arm ache and shoulder pain for the user. 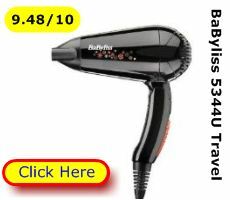 The best buy hair dryers are both light weight and well-balanced, making them suitable for intensive salon work or drying long and/or thick hair at home. Examples are the Parlux 3800 and BaByliss 5560GU. 4 Is the dryer powerful enough for your hair type and style? Does the dryer have more than 1 speed setting? You want the option of a second “boost” setting. This is especially important for long or thick hair. You want to quickly and evenly dry hair from root to tip in order to achieve your chosen hair style. 5 Does the dryer have multiple heat (drying) settings? Multiple heat setting are let you warm the air according to your hair length, type and style – and avoid scorching. You may want to commence with a hot setting to dry hair. Then switch to a lower setting to dry evenly from hair root to tip. A “Cool shot” function relaxes or sets the hair into the style you want to achieve. This is important if you have long, wavy hair and want to set it in a straight style. 7 Are Beauty Tool Attachments Available for my Hair Type? Some dryers come with clip-on concentrator nozzles (also available separately). These are used to direct the airflow precisely from root to tip. Useful for long, thick and straight hair. A diffusor nozzle is a clip on, circular, comb like structure designed to give volume to fine or curly hair. 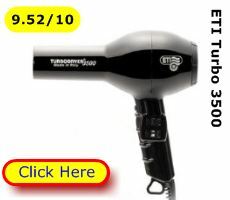 A few blow dryers come with this attachment, but it is easy to buy them separately. 8 Is this an Ionic Hair Dryer? An ionic hair dryer produces a stream of invisible, harmless negative ions. The primary objective is to counter the static that causes frizzy or fly-away hair. This is caused by cold weather or using plastic hair combs. Best buy examples are the Parlux 3800, BaByliss 5560GU and Diva Veloce 3800. An ionic dryer may be a useful beauty tool for people with fine or very long hair. You want to be comfortable using the dryer without being hunched over the power socket! A 3 metre power cable will give you room to manoeuvre both at home or in the hair salon. A hanging loop is useful in salon work (or to de-clutter your home). Which dryers in our top 10 have all these qualities? You’ll find them here on the compare hairdryers page. A hair dryer (sometimes called a blow dryer) is a hand held beauty tool that contains a motor and heating element to blow warm air over wet hair. 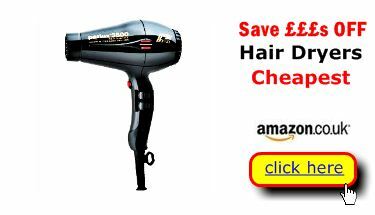 Get the wrong, cheap hairdryer and you may find it’s just not up to the job of drying your hair quickly and setting it to the style you desire. It may even scorch your scalp and heat damage your hair. 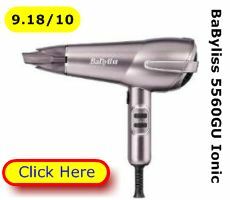 Get the best hair dryer at the cheapest price and you’ll acquire a beauty tool that will last for years at home or at the salon. It will also cope with the different lengths, types and styles of hair found in your family or among clients. Wherever you are in Britain, Best Buys Compared will guide you to the blow dryer that’s best for you – as nominated by the experts who really know – fellow UK owners and users.